Let me first say that I definitely didn't come up with the recipe on my own. 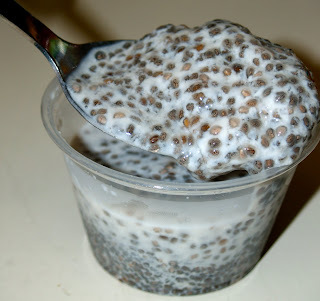 No, I browsed a number of blogs mentioning Chia seeds and puddings before ever embarking on my own experiments. I did some tweaking and came up with this 75 calorie snack. Chia seeds are this magical food that everyone is talking about lately and I had no idea why... other than they are good for you. It turns out that Chia seeds have been around since the Aztecs who prized Chia seeds like gold. A good source of Omega-3 essential fatty acids, Chia seeds are also chock full of fiber and other nutrients. Amazing stats, right? Why am I just now learning all of this. Chia seeds -- where have you been all my life???? Back to the pudding. What is cool about Chia seeds is that they also act as a thickening agent. When added to the almond milk, they become almost gelatinous with semi-crunchy beads throughout. Mix together and let sit chill for twenty minutes of up to 24 hours. It will continue to thicken overnight. I enjoy this as a dessert, a snack, or even as part of a morning meal. I just found chia seeds, too! Do you find that they have a very slight peppery taste? I thought they should be flavorless, but I'm not sure how fresh my seeds were! Never had chia seeds...they look very interesting and intriguing. Sounds good though with the Omega 3s - I'd prefer the seeds over fish oil pills. This sounds delightful! I'll have to get some chia seeds very soon and try this! Wow! What a great post! They added Chia Seeds to the crackers I buy and didn't really know what all the hype was about. I am so intrigued I might have to make this pudding. this is the third chia post I've seen tonight! Guess I'll have to pick some of these babies up. The pudding looks great! yum! Looks good! Thanks for sharing! Im loving the chia pudding!! ive only made chocolate so far but your vanilla recipe looks awesome!! its a must try! I love the crunch they add to foods. Sometimes I throw them in my yogurt or something just because I like crunchy things in my food! Thanks so much for sharing!!! I have never had chia seeds before but this looks very tempting!! Thanks for the recipe! No idea about chia seeds the Aztecs with chocolate and now these exceptional seeds! where has this been all my life??? ?